The BlackBerry 6710 is the first BlackBerry handheld to offer an integrated speaker and microphone. This integrated dual-band GSM phone, email client (with support for corporate email servers), organizer and web browser is the ultimate weapon for mobile professionals. The 6710 follows the standard BlackBerry form factor. The 160 x 160 screen, which can display up to 20 lines of text, is placed above a QWERTY thumbpad. The screen offers plenty of real estate to view your emails and web browser content. The popular BlackBerry user interface is here, too, which makes it easy to navigate the phone's functions. A jog dial is located on the right side of the unit for quick scrolling through menus and emails. There's also a standard 2.5mm headset jack that can be used with the included headset. A removable lithium-ion battery is housed in the rear of the unit, and there is a docking port-- which mates with the included docking station-- for email, address book and calendar synchronization. Many of the calling capabilities folks have come to expect in a wireless phone are present in the 6710. A vibrating alert is provided, as is a contacts list/address book that is limited only by the unit's 16 MB of internal memory. Make and receive calls with the built-in microphone and speaker, or use the included headset for handsfree operation. The 6710 delivers the legendary BlackBerry email experience. With AT&T's BlackBerry service plans, you can receive emails instantaneously from your personal and enterprise email accounts. With BlackBerry push technology, you don't need to retrieve your email. BlackBerry devices are designed to remain on and continuously connected to the wireless network, allowing you to be discreetly notified as new email arrives. If your company has BlackBerry Enterprise Server installed, you can take advantage of the power of wireless calendar synchronization. Your calendar events are exchanged wirelessly and automatically so that your desktop calendar and BlackBerry device calendar are synchronized. All your Outlook meeting requests, changes, and updates are instantaneously synchronized with your desktop. Make meeting requests, invite new attendees and more, all on your 6710. Users without Enterprise Server support can manually sync with their desktop calendars and contacts using the included BlackBerry Desktop software and the included docking/charging cradle. Use the 6710's Web browser to access the Internet from the palm of your hand. Browse Web sites, get up-to-date stock quotes, read the latest news, check weather reports and more. Wireless text messaging is also supported by the 6710. The 6710 also ships with a number of tools, including a calculator with a unit converter, and a to-do list. The RIM BlackBerry 6710 weighs 4.86 ounces and measures 4.76 x 2.9 x 0.7 inches. Its lithium-ion battery is rated at up to 4 hours of digital talk time, and up to 10 days of digital standby time. It runs on the 900/1900 GSM/GPRS frequencies. The phone comes with a one year limited warranty. The 6210 follows the standard BlackBerry form factor, but with a slimmed-down profile. The grayscale screen, which can display up to 15 lines of text, is placed above a QWERTY thumbpad. The screen offers plenty of real estate to view your emails, web browser content, messaging sessions and attachments. The popular BlackBerry user interface is here, too, which makes it easy to navigate the phone's functions. A jog dial is located on the right side of the unit for quick scrolling through menus and emails. There's also a standard 2.5mm headset jack that can be used with the included headset. A removable lithium-ion battery is housed in the rear of the unit, and there is a USB port for email, address book and calendar synchronization. Many of the calling capabilities folks have come to expect in a wireless phone are present in the 6210. A vibrating alert is provided, as is a contacts list/address book that is limited only by the unit's 16 MB of internal memory. Make and receive calls with the built-in microphone and speaker, or use the included headset for handsfree operation. The 6210 delivers the legendary BlackBerry email experience. With AT&T's BlackBerry service plans, you can receive emails instantaneously from your personal and enterprise email accounts. With BlackBerry push technology, you don't need to retrieve your email. BlackBerry devices are designed to remain on and continuously connected to the wireless network, allowing you to be discreetly notified as new email arrives. Support is also built-in for viewing email attachments (Word, Excel, PowerPoint, WordPerfect, and PDF formats). If your company has BlackBerry Enterprise Server installed, you can take advantage of the power of wireless calendar synchronization. Your calendar events are exchanged wirelessly and automatically so that your desktop calendar and BlackBerry device calendar are synchronized. All your Outlook meeting requests, changes, and updates are instantaneously synchronized with your desktop. Make meeting requests, invite new attendees and more, all on your 6210. Users without Enterprise Server support can manually sync with their desktop calendars and contacts via USB using the included BlackBerry Desktop software. Use the 6210's Web browser to access the Internet from the palm of your hand. Browse Web sites, get up-to-date stock quotes, read the latest news, check weather reports and more. Wireless text messaging is also supported by the 6210. Also, 6210 ships with a number of tools, including a calculator with a unit converter, and a to-do list. 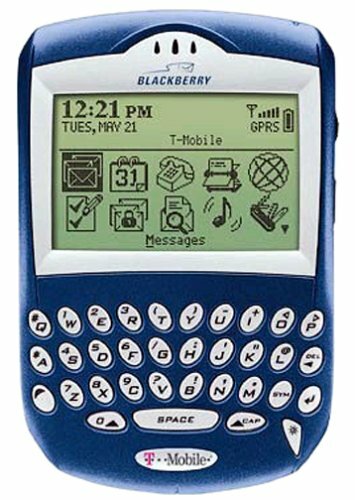 The RIM BlackBerry 6210 weighs 4.80 ounces and measures 4.45 x 2.91 x 0.83 inches. Its lithium-ion battery is rated at up to 5 hours of digital talk time, and up to 12 days of digital standby time. It runs on the 900/1900 GSM/GPRS frequencies. The phone comes with a one year limited warranty. Although not exactly on the cutting edge, the reasonably priced Motorola M3682is a good choice for basic voice calls and two-way SMS text messaging. The M3682is a relatively bulky phone and lacks some desirable features such as voicedialing, voice memo recording, or vibration mode, but it does have better-than-averageuser interface and menus. The standard headset jack enables hands-freeoperation, and the M3682 is bundled with a hands-free headset. The M3682 is a single-band1,900 MHz GSM phone that, like allGSM phones, uses a removable SIM card to store your account information andphone number (our test phone was provisioned by VoiceStream Wireless). Weighing in at 6.2ounces, with standard NiMH battery included, the M3682 measures 5.4 by 1.9 by1.0 inches (not including its 1.25-inch stubby antenna), making it a relativelylarge, though still lightweight, phone. A flip cover protects the keypad, and itlets you view the backlit display, comprised of four 12-character lines and textplus status icons, and use the large control keys. The black case of the M3682doesn't feel as sturdy as other Motorola phones, but we had no problems whileusing it. Furthermore, the phone survived an inadvertent 3-foot drop onto acarpeted concrete floor. Left and right menu buttons activate the phone's menusystem, and an OK button, located just above the menu buttons, selects thecurrent option. The C button clears the last entry, and an up arrow buttonlaunches the icon-based quick access screen, which lets you quickly select fromnine common operations such as locking the phone, calling voice mail, or lookingup a name in your phone book. The phone has 12 ringer tones with a separatevolume control menu (no volume keys), but no vibration mode. The M3682's phonebook can be split between the phone and the SIM card, provided your carriersupports it. Up to 100 numbers can be stored in the phone, and potentially 55more numbers on a SIM card. Another 40 numbers can be stored in a restrictedcall list. In this mode, only the numbers on the list can be dialed. Enteringphone numbers is easy: just tap in the number and a unique descriptor, thenassign it to a memory location. The first nine memory locations can be dialedwith one touch--just tap and hold the respective key and the stored number isautomatically dialed. As with all GSM phones, the actual features that areusable in the M3682 depend on the carrier's provisioning via the SIM card. Intotal, the Motorola M3682 supports caller ID, call forwarding, caller on hold,and conference calling for up to two other people. Two-way SMS text messaging with aselectable cell broadcast mode to receive alerts and notices from outsidesources is also featured. Security features for the M3682 include phone lockand selective call barring of incoming and outgoing calls (if supported by thecarrier). You can also block your caller ID information from showing up on acall recipient's phone. Since it lacks an infrared port, the only way to usethe M3682 with a PC or other device is via an optional data cable. No softwareis included for synchronizing phone book numbers with a PC. The M3682's ratherlarge NiMH battery is rated for a maximum 210 minutes of digital talk time and105 hours of digital standby time. In testing, our sample phone held a call fornearly 210 minutes, and it lasted for 96 hours in standby mode. One of thephone's best features is its ability to use standard AA alkaline batteries,thanks to a special battery-compartment backing. You can also use single-uselithium-ion battery packs, but not rechargeable lithium-ion AA batteries. Abasic phone for ordinary users, the Motorola M3682 scores high marks in ease ofuse, but lacks desirable features such as voice dialing and vibration mode. The phone is great.The signal strength was always strong.The battery life was good and lasted pretty long being that I'm always on the phone with my wife.The camera works great, no grainy pictures.Screen is big and clear.Calls are clear. Although the phone is great and I still love it, it began to go stupid on me as the months went by.Ringtones that were deleted mysteriously reaappearred and some assigned ones played different tones.You can't see who's calling you unless the screen is flipped open, but that lets the screen get scratched up.Ringtones are low because they play from the receiving speaker.Flash doesn't do anything.You will never use the phone with it's flash because the barrel pointed its way is useless.Voice dial is only a feature for the visual impaired because it takes about 2 minutes to make a call without it.Sometimes I would end up calling the wrong person, the numbers cross with different names...crazy.I love this phone and just would wish for samsung to make it better.It would've been great if they had included a speaker on the outside of the phone as well like verizon's version so you can talk with the phone flipped either way and have louder ringtones. POOR PHONE.... POOR CUSTOMER SERVICE!!! Okay... I have had this phone for over a year and these are my perrels with this good-features crappy-designed phone. -Atenna: Within about three months, there was an internal problem with the phone and my atenna broke off. I should have taken it in right there to get a new phone but I figured the hell with it,I get alright reception anyways. -Scratching: First 3 weeks I got the phone it scratched very easily from just normal usage of phone and after about 2 months the paint was was chipping at the sides. -Creaking: After about 5 months the rotating camera would creakin and catch on the track - same with the swivel screen. -Detaching Top Portion: At about 12 months the top swivel screen would get looser and looser just from using the phone and the special swivel feature.Screen went totally black... would not go back to normal. Called to get a new phone or ANYTHING AT ALL and got told there was nothing and I have to buy a new phone. It is a terrible design that breaks and falls apart within a year... and Sprint has terrible customer service. You pay $250 dollars for the thing for it to just break in a year by a faulty design. I would have purchased insurance on the phone but it was NEVER offered to me. Highly discourage this phone without insurance or extended warranty. This phone is crap, I'm sorry.I had the VGA 1000 which I was very satisfied with. I lost the phone and got the A600 as a replacement. The 1st thing that disappointed me was it has no external screen.If u want to know who's calling, u have to have a specific ringtone assigned or flip it open to see. The screen thingy swivels at a 180 degree angle but it wound up detaching itself to the point where the screen would not work. Another thing that pissed me off was that the charger wouldn't stick in.I had to prop the phone upright so that it could charge.How ghetto is that?! I replaced that phone and wanted to get a VGA1000 again but under the equiptment replacement program, i could only get what was in stock.How convenient.Another A600 was sent to me and the same thing happened again!I didn't even swivel it but it detached on its own.I started noticing how the screen would start to die on me.I would press a button and nothing would happen on the screen.Sometimes I would unintentionally call a person.The flip thingy was so loose, u could shake it and it would rattle.Sooo ghetto. Horrible battery life, takes forever to charge.Quite cumbersome due to the large internal screen but it should at least have an external screen to make up for it.Also, if u let the phone drop, even a small bang, the battery goes flying.The button to release the battery is too easy to push. Dont' get this phone.It is flimsy and will only give you headaches.Get a VGA100 which shares the same easy menu but has an external screen. This phone is the best! Everybody should get it. Great camera and it turns 360 degrees so you can close it and still see the time. It also has a vibrating ring tone so you can get it when it vibrates. cell phone I've ever had, bar none. hear from the phone well. forever to do things.Definitely an exercise in patience. worth the amount of money I had to pay for it. 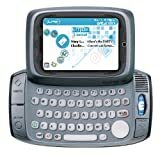 Compatible with T-Mobile service, the color Sidekick features a large 11-line color screen, a full QWERTY keyboard, the usual PDA features, and a wide range of AOL-based online services, in a device aimed at users who want versatility over portability in their "hiptop" computer. In addition to being a full-featured cell phone, the Sidekick also provides Web browsing on T-Mobile's national GPRS network, which includes access to Sidekick forums, contests, and a personalized homepage. It also provides up to 6 MB of email storage, and users with AOL accounts (not included) can sign on and access, manage, and set up as many as three different POP3 e-mail accounts and use AOL Instant Messenger to chat with anyone on your AOL Buddy List. The device also sports a customizable address book that lets you give favorite contacts their own ring tones, blinking light, and their own caller ID picture, taken with an available attachable camera. The camera also works for taking pictures of just about anything else that strikes your fancy, for easy storage or emailing to other interested parties. The Sidekick's PDA functions include wireless synchronization to your desktop, configurable notifications to alert you to important events and information, a personal information manager (calendar, address book, notes, etc.) backlighting, a clock, and a thumb control for the included arcade-style games Rock & Rocket and Snowbored. Cell phone features include a text message indicator, voice mail button, voice mail indicator, volume select/display, and a signal strength indicator. Cell phone features include built-in paging, caller id, conference calling, call waiting and call hold, customer care, access to directory assistance, emergency calls, detailed billing, voicemail with message alert, call forwarding, international dialing, call restrictions, lock alarm, call timers, redial, missed call indicator, call log, any-key answer, auto-answer, auto-redial, speed dial, mute control, no-answer transfer, one-touch 911, vibrating ring, and differential ring. Its phone book capacity is 2000 entries. Important note: It's required that you add the Sidekick Unlimited Data option to your service plan before you check out. Still using the Sidekick color... With the Amazon rebates it was hard not to pass up.I had no reason to "upgrade" to the Sidekick II and I'm still using the I with much satisfaction. Aside from the painfully slow Web browser, the email and AIM functions alone make the price of the unlimited monthly data service worth the cost to me. The keyboard is fairly easy to use. My first phone stopped working properly but I found the replacement process from T-Mobile very straight forward and convenient and the tech support very helpful. The coverage has exceeded my expectations. I would buy this item from Italy, so I need an unlocked item, it means non linked to any USA or ouside provider so I can use it in Italy by my personal SIM CARD. After a nasty and EXPENSIVE run-in w/ another cell phone company, T-Mobile and the Sidekick (v. II in my case) are a breath of fresh air.Polite service, good to excellent coverage (range), reasonable, prices and there are all sorts of other uses.It's aCell phone, PDA, email server, web brower, text messenger, etc.Also, it is pretty rugged (it would have to be to put up with my chaotic and oftimes clumsy antics). Why not maximize the muscle this thing has?My only complaint is that the unit is, beyond all the goodies listed above,essentially a wireless modem with a USB port.Why not take full advantage of these qualities / features? Some people are.A recent review (JP Holloway "JP"
Reviewer Rank: 400401) said third party programing is available, but fails to name names.I sure would like to know. Also, put Bluetooth in the next update. Compatible with T-Mobile cell phone service, RIM's Java-based BlackBerry 6230 is a business-oriented phone, organizer, and communication device that works like a normal phone but also happens to give you e-mail access, SMS text messaging, and Web browsing along with everything you'd expect from an organizer--all in a single wireless handheld that supports international GSM/GPRS roaming. The 6230 uses a 160 x 100 pixel monochrome screen and comes with an easily attaching headset for convenient, hands-free conversation so you can read, type, or retrieve information while you talk. The 6230 offers tri-band 900/1800/1900 MHz GSM/GPRS networking and operates on 1900 MHz in the US and Canada (900/1800 MHz in Europe/Asia Pacific). GSM/GPRS networks grant "always-on" operation and let you maintain a virtual connection to the wireless network for data services. GPRS (General Packet Radio Service) is a packet-switched network designed for wide-area data communication, while GSM offers high-quality mobile voice services. Hold the 6230 to your ear like a regular phone so you can answer it quickly, or use the included headset to talk while you read and type on the unit's backlit QWERTY keyboard. The 6230 fits comfortably in your hand as you send and receive calls worldwide. Its PDA format provides a nifty, thumb-operated track wheel for extra-easy dialing and menu navigation. The 6230 also includes an integrated earpiece and microphone, call-alert options (tone, vibrate, onscreen or LED indicator), and selectable font sizes. The 6230's embedded RIM wireless modem offers a variety of wireless Internet services, including e-mail with integrated attachment viewing. You can integrate the unit's e-mail with existing business e-mail accounts, existing personal e-mail accounts, or with a new handheld e-mail account. SMS capability lets you send and receive short text messages independent of an e-mail inbox, and you can use the phone's keyboard to quickly exchange messages with other SMS-enabled devices. The 6230's BlackBerry Desktop software (3.6 or higher) works with BlackBerry Enterprise Servers, which are supported by Version 2.1 or higher for Microsoft Exchange or Version 2.0 with Service Pack 2 or higher for Lotus Domino. It also supports Java development platform based on open standards. When you're using the handheld, a browser, and software-development tools, the BlackBerry Enterprise Server's Mobile Data Service (MDS) grants always-on/push-based access to enterprise applications and information. Security features include password protection and keyboard lock. Maximize your productivity through easy access to your calendar (manage and schedule appointments while you're on the go), address book (access all your important contact information wherever you are), and task list (add, edit, and delete tasks and mark tasks as complete). MemoPad lets you compose, edit, and delete important notes and memos, while a calculator lets you perform basic mathematical operations and conversions. 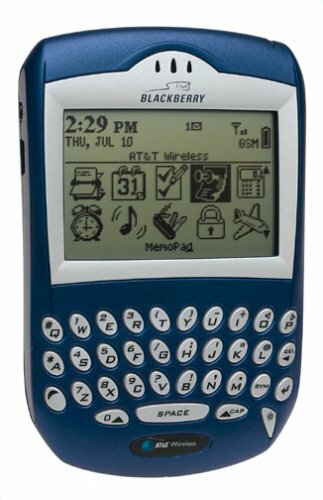 Sorry Oprah: My brother-in-law got to me saying I had to have a Blackberry before this little gadget appeared on the "O" Favorite Things list. 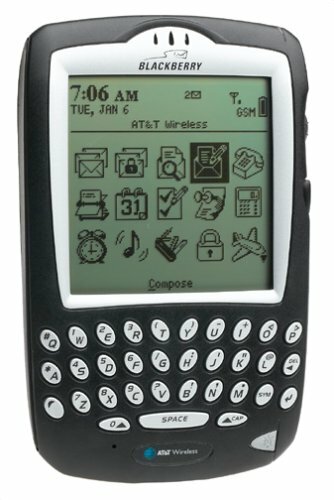 Like all cell phones and wireless Internet devices, the Blackberry has its quirks, but I wasn't half so happy with my Palm VIIx. Where to begin with the luscious Blackberry?There's the calendar for one.To-do list.Notepad.Web browsing with T-zones and local info, plus finances.....and e-mail!You can sync your POP e-mail, whether it's your own unique domain name address, Yahoo!, AOL, Hotmail, Earthlink, Roadrunner...you may be tempted to think you don't need a computer.While the Blackberry may not replace your PC/Mac, it will increase your productivity and help you organize your life.Drawback: You won't be able to put it down! I have been a loyal customer or ATT for years and upgraded from a problem free Nokia 3360 to this flimsy piece of garbage. This is, hands down, the most horrible phone I have ever owned. For starters, the case is made of cheap plastic which would be ok if the inner components were of superior quality, but they are not. In this case, you can definitely judge a book by its cover. If you are going to talk more than 15 min's, have the charger ready because the battery will die. Of course, you will only get to use the charger if the phone LETS you stay connected for 15 min's. For me, the average is 7. Then the phone will either drop the call or the unit itself will just shut down. And keep in mind, the entire time you are talking there is static and calls fade or blank in and out. The phone gets very, very hot while in use, standby time is non-existant and the extremely smudge-friendly display is a constant annoyance. I could go on, but won't. Read the other reviews and make an intelligent decision. Decide against this bug-ridden device. Bought 2 of these at top dollar ~1yr ago for me and my wife .. same 'ol story .. dropped calls, poor reception, emergency only status in high reception areas, phone turns off out of the blue, voicemail alerts coming through days after the fact (after a phone reboot), etc, etc, etc.....and "NO" it's not the provider - I've been with AT&T Wireless for over 10 years and have had the original analog Moto flip phones, several different Nokias, and now these - never has it been this bad, even in the old analog and early digital days.Phone has nice features, nice look, color display, slim & lightweight design - it's just a POS. 1- The reception is terrible, i have friends with AT&T phones next to me, and They have better reception, I changed to a new T721 under warrantyand it's the same....no good reception. Although we have a slight quibble about this phone's overall performance, the Mitsubishi T250 is still a suitable phone for Web use. Its generous 10-line screen (8 lines of text) and quadmode technology, combined with AT&T's PocketNet service, makes for good surfing. And with a tap of the Mode button, you can toggle between Web and phone features. While the phone's processor seems a bit sluggish and its battery life isn't the greatest, if you are looking for data phone, the T250's Web features may whet your appetite. The T250 operates as a quadmode TDMA phone for voice calls, and it provides access to Internet and data services over the CDPD network, a packet-based wireless IP network. It measures 5.6 by 2.2 by 1.0 inches and weighs 7.1 ounces including battery. Even though its design is reminiscent of earlier cellular phone models, the T250 is well balanced and highly portable. The battery clips on and off easily, and the headset jack is located on the right side. The Menu and Express navigation keys are located right in the center of the phone. The Express key is also doubles as a shortcut to voice-mail and text-message mailboxes. As you scroll through menu options, prompts appear over the Left and Right Softkeys. You use these keys to execute any action displayed on the screen. Press and hold the Mode key to power the phone on or off; or press it lightly to toggle back and forth between voice and data modes. The T250 also provides Send, End, and Clear keys, and features a generally well-designed keypad. The T250's 10-line, backlit-indigo screen is better than that of any phone we have seen, and it allows you to see your entire range of options without much navigation. The menu provides a standard set of options: You can log on to the Web wirelessly, set caller preferences, check on your phone's status, enable a variety of security features, access your phonebook, and more. While the menu itself is set up well, the phone's processing speed seemed surprisingly slow. We experienced sluggish reaction times with almost every task we tried, from scrolling through phonebook entries to navigating the Web. The phonebook holds up to 99 names and numbers. You can manage your phonebook entries by assigning any of the four ringer melodies to them. (This way, you know who's calling by the sound of the ringer.) When we updated our phone book, we noticed the T250 alternated unpredictably between standard alphabetical entry and a T9 entry mode. Also, the T250's ringer was barely audible even at full volume. If secure usage is one of your hot buttons, the T250's authenticated and encrypted data transmission, wireless fraud protection, and electronic locking features are sure to please. To enter this menu, you are required to enter your security code. Then, you can set different call restrictions, lock codes, clear any phone-book or call-log numbers, and reset your browser cache. The T250's data port is located at the bottom of the unit. Using a standard data cable, we found it simple to tether the T250 to our PC. The modem installation procedure, handled by our computer, took less than five minutes, and the user manual is designed to walk even a first-time user through all the steps without fail. Once we were in sync, we could swap phonebook information, text messages, and e-mails back and forth. Except for the phone's generally slow response times, navigating the Web was enjoyable. The T250's NiMH battery is rated for 120 minutes' digital talk time and 120 hours' of digital standby time. Our own battery testing produced somewhat mixed results. We could not confirm the talk-time rating, as we never got a call to hold longer than an hour despite testing in an area with strong AT&T service. The phone did last for five days in standby mode, but we noticed significant battery loss if we performed the simplest functions, and everyday calling drained the battery quickly. If you are serious about owning this phone, we highly recommend purchasing an additional battery for your peace of mind. Unquestionably, the phone has the best screen we've seen and some technically advanced features, but the T250 seems to have as many quirks as it has advantages. If portability and convenience are paramount interests, and you don't need a phone for Internet access, the Ericsson A1228LX is worth checking out. This dual-band, trimode TDMA phone may lack voice-activated dialing and other bells and whistles, but it's an attractive, well-designed phone with solid call-management features at a tempting price. The A1228LX measures 5.1 by 2 by 1 inches and weighs 6.1 ounces, making it a manageable, highly portable phone. The backlit display shows three lines of text, bright well-organized menus and a full host of indicators to keep you in step with the phone's operation. The A1228LX features Ericsson's intuitive Yes/No button navigation with a rocker bar that lets you scroll through menu options and call logs. Built-in call-management features include a 20-number incoming and 40-number outgoing call lists, 25 ringer options, 99 speed-dial locations, one-button dialing for up to nine phonebook numbers, two separate credit-card dialing locations, and a series of call timers. The phone lacks a scratch pad memory, so you can't store phone numbers while you are on a call. The A1228LX does have Short Messaging Service (SMS) and fax capabilities, with one-button callback for numbers embedded in text messages. SMS is a handy feature; we used our sample phone (provisioned by AT&T Wireless), to make a movie date and tell friends we were running a bit late. While not as advanced as e-mail, SMS is just as useful in many situations. Provided your service plan supports it, A1228LX also offers caller ID, call forwarding, call waiting, and other popular call-management services. On the connectivity front, the A1228LX will sync with Ericsson's own phone-book manager accessory, as well as other PIMs. While the A1228LX isn't really designed to support high-end business use, it's a lot easier to manage your phone book and contact lists on the PC rather than trying to enter text on the phone. The A1228LX is equipped with standard security features: a personal security code, keypad lock, and selectable outgoing- and incoming-call restrictions. It also includes voice encryption and authentication capability, which prevents airtime fraud. Our sample's battery performance was admirable. The NiMH battery achieved four hours' digital talk time and 135 hours' digital standby time, which matched up with Ericsson's ratings. Compatible with AT&T cell phone service, this factory-refurbished Sony Ericssons T62u is equipped to provide coverage on TDMA, GSM and analog networks, you can go just about anywhere and get reception. You'll also get voice commands, Internet access, EMS picture messaging, and more, all displayed on a large, 8-line black and white LED screen. For calling, the T62u runs on GAIT technologies, which allow seamless roaming between GSM and TDMA networks and seamless SMS and Wireless Internet service on these networks. You'll also get call timers, redial, missed call indicator, call log, voice activated dialing, a dedicated voice mail button, any-key answer, auto-answer, speed dial, mute control, vibrating ring, differential ring, and a phone book capacity of 500 entries. Organizer and Internet features include Bluetooth PC sync compatibility via Smartback accessory (sold separately), a calendar and contacts list that can sync with MS Outlook and Lotus Notes, WAP Internet access, e-mail, and EMS messaging, which lets you send, receive, and edit text, graphic and photo messages to and from you phone and compatible phones and PCs. The T62u weighs 4.48 oz. and measures 4.76 x 2.13 x 0.91 inches. Battery talk times are rated at up to 210 minutes and standby times are rated at least 210 minutes. The Sony Ericsson T62u is a true nationwide phone. With coverage on TDMA, GSM and analog networks you can go just about anywhere. This update to the v60i model adds EMS, chat, downloadable ringtones and graphics. Other notable features include world roaming and GPRS high-speed data. The V60 i loved for about 6 months then a relitive got got a Sanyo 4700 with Sprint.I laiked that much better because the voicemail told you who your message was from, aqnd the ringers sounded better and were much louder.My other complaint was major when about 18 Months after haveing the phone my antenna broke off and was lost.AT&T would only give me a refurished Nokia 1260 which was not a nice or as expensive as my phone, and would only give it to me if I gave them my V60 and a 1 Year contract.So since I only had another 6 Months I did nothing about the phone, but I went to a smaller plan and gat a Samsung A600 with Sprint and have no Complaints, because the Motorola literraly whold only work in the AT&T Wireless Location. THIS PHONE IS OFF THE HIZZLE FO SHIZZLE i showed my girl my cell phone and she was like whoa! man dat's good. i like the way this phone looks it looks like a cell phone.... weird. anyways i haven't had any problems with this phone and i like it alot PEACE OUT G! Looks nice, works well, and doesn't have extra stuff that you don't actually use. Just everything you NEED, making it a resonable price. I am researching a class action lawsuit against AT&T and Motorola. I have statistically researched both of my phones, and have peoved them to be defective. They both have %70 failure rates, in major cities, with full charges,and full antena reception. Our phones have been overcharging us continually hundreds of dollars ecach month. Every answer you will get from both is that it is your problem, not the phone or your service operators company. They are lying, they are aware this model is defective.I am looking for others with similar complaints, to join the suit. If you have suffered from the same problems contact attv60iclassaction@Yahoo.com to join the class action. I upgraded to the V60i a few months ago and have been very satisfied with it. The compact size makes it easy to carry and it comes with a clip, so that I can hook it to my purse strap or belt. I have no complaints about reception even though quite a few of my friends in the area have major problems with the reception on their phones. This may be due to the AT&T service and not the phone, but it is worth mentioning as I have never had calls drop out nor lost signal. What I like most about this phone though is the alarm clock funtion. I am able to have many different alarms at one time. This comes in handy due to a changing schedule - I can just select a preset alarm time instead of setting a new alarm each night. What a great feature! Waste of Money, Doesn't even deserve one star! $75??? Give me a break, this horrid peace of junk isn't even worth $0.75! I don't own this one, but my mom does and she really wants to get a new one but she's bound by a contract. The backplate that protects the battery fell off and is duct-tapped on for "protection". I had to leave my cell phone at home one day while it was charging and I was out shopping so I borrowed this one. Well, let's just say that I missed my phone! I couldn't hear what Mom was saying (even on high volume), the reception kept staying at one or two bars and it doesn't have a vibrate or silent ring so she constantly has to turn it off which means she doesn't call me back for several hours sometimes. I also don't like how small it is because it barely covers my ear which means I can't really talk into it. Plus, it would always turn off in my pocket. Oh yes, and the menu is almost impossible to follow! You have to press "Off" in order to go back, what's up with that???? 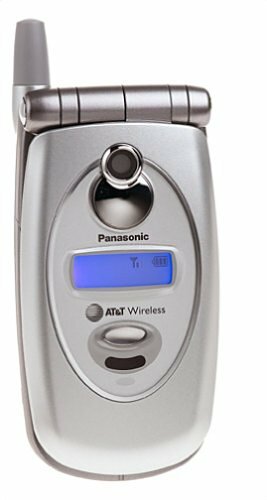 I would recomend a flip-phone so you can actually speak into it and so that the off button can't be presed unintentionally. Oh yeah, and anything that is not Simens! My sister and I are both pleased with our Motorola flip-phones, if that helps any. Sony-Erickson phone about 9 months ago.I have to say that it's held up to my abuse quiet well, that includes dropping it on concrete several times. Something I am not recommending you test. Despite a couple of divots on the corners, the phone works fine. So all these one star reviews seem a bit one-sided. I have had nothing fall off or even become loose. It's a sturdy little phone. The reception is good. That may have to do with location, but I have used it while traveling in several different states. The speakerphone works well though the volume is not high enough for very noisy environments. The voice recorder can only record about 3.5 minutes so for me it's nearly worthless and I don't think its controls were well-thought, it's too easy to turn it on unintentionally so after a while it becomes a nuisance. I could do without it.The menu navigation took some getting used to and it's not intuitive. Once I learned some numeric shortcuts it became more useable for me, but others may not be so patient. Using bluetooth to Sync it with my apple computers has not been a problem.I was able to sync my old Sony-ericsson T68, then remove the card, and place it the Siemens S56, turn it on and then transfer my addressbook via bluetooth.It worked fine though I found the phone numbers in autodial wouldn't dial they just beeped at me.If I went in edit mood, modified the entry and saved it seemed to work fine after that.That was a little annoying, but otherwise things worked. Text messaging works fine though with any phone this small, it's a bit tricky to push buttons fast enough.The manual could be better. 3-way calling turned not to be that hard to do but explanation in the manual was almost non-existent. I like the phone, but for a non-techie, the interface could seem a bit too cluttered and the learning curve too steep. For some. it will be loveable. This is the worst phone I've owned.The chrome plastic piece covering the speaker fell off on its own after one month and I had to superglue it back on.Then the buttons started falling off.Fortunately my Cingular plan allows me to upgrade. Match these mechanical failures with the overly complicated operating system, and you have an expensive door stop. I will never purchase anything made by Siemens again. The 7250 is an amazing phone. I got it the winter of 2003 in Europe and Im still not sick of it. This phone is VERY easy to use considering all the features like camera and FM radio. The loudspeaker can be used on calls (speaker phone) or to play the radio out loud. It comes with dual earphones that can be used with the radio or phone calls. When you talk to someone with both earphones in, you hear them on a whole new level, not to metion its hands-free. The color screen seems very large compared to the size of the phone. Web browsing is easy and faster than what i had expected it to be. Downloading ringtones, games and wallpaper is very easy from you service providers website. I am using this phone with T-Mobile and customer service is great. Personally, i dont like AT&T. The 7250 is beautiful and I love using it. This phone is hot, and if you have the $$$ buy it. I used to work at a cell phone store so i know my phones, and to be honest, this is the best phone on the market right now in my opinion. If you like small, lightweight, and good looking phones, this is the phone for you! The Ericsson Go Everywhere T18LX phone may not represent the pinnacle ofwireless technology, but it's a substantial, relatively lightweight phone thatis packed with personalized call management options. If you simply can't livewithout wireless Internet access, you will want to look elsewhere. But if youare looking for an otherwise versatile, feature-rich phone that can act as anextension of your office, read on. The T18LX is a TDMA tri-mode phone thatoffers both dual-mode and dual-band capabilities. We were immediately impressedwith its solid construction, flip keypad cover, and efficient design. Weighingin at 5.4 ounces (including battery), the T18LX measures 4.2 by 1.9 by 0.9inches, not counting a stubby antenna that extends another 1.2 inches. Thismoderate-weight, ultracompact design makes the T18LX easy to carry. Its solidconstruction should also hold up well to a variety of daily traumas. Theuncluttered keypad features yes/no buttons, which, along with the up/downarrows, allow for seamless menu navigation. The CLR button corrects mistakes andbrings you back to the main screen when you are done cruising the menus. Theflip keypad cover, side volume keys, and backlight and contrast controls add tothe T18LX's well-planned design and ease of use. However, the screen itself istiny--we mean, really tiny. While it's fine for making calls and even receivingshort text messages, any complex text entry or navigation would be unpleasant.Perhaps, then, Ericsson did us all a favor by not equipping the T18LX with aminibrowser. The 250-name phone book has 10 group lists, including threecustomized lists. The 25 different ringers are standard. You can also assign aringer to any group, so you'll know right away if someone from work, school, or one of your friends is trying to get in touch with you. As any goodcellular phone should, the T18LX supports carrier-dependent services such asshort text messaging (15 message capacity), caller ID, and voice mail. The "1"key provides one-touch access to your voice mail, and the phone allows for one- touch callback to numbers imbedded in text messages or pages. Standard 40-numbercall logs, both incoming and outgoing, are a useful reference, while the twocalling-card slots will prove valuable to anyone who makes a lot of long- distance calls. Other features that will please mobile professionals and otherbusy people are auto area, which lets you program a default area code, speeddial, one- or two-digit calling that corresponds to the positions of your phonebook entries, and super dial, one-touch access to your first nine phone bookentries. Auto retry, when enabled, repeats a call every 15 seconds for threeminutes if the cellular system could not connect the call. Throw in any-keyanswering, muting capabilities, scads of standard customizable tones and alerts,and built-in vibrating call alert, and the T18LX can do battle with just aboutany rival. While the T18LX doesn't incorporate any truly unusual features,digging into the phone's options reveals some clever user preferences to playwith. The profiles menu lets you customize phone settings for nine differentenvironments, so the phone will ring quietly at work, or loudly at the airport.And, if your carrier supports it, system select lets you prioritize and selectthe systems from which you can obtain service. This can be especially handywhile roaming or if you have access to more than one mobile system. Normallywhile roaming, the T18LX first looks for service on a public network, thenprivate, and finally residential. However, system select lets you change thepriority of the system for which your phone searches. The T18LX offers theusual security settings, including PowerOn lock, keypad lock, and lock dial,which limits outgoing calls to your specifications. SecurityCode, which lets yourestrict access to calling-card numbers and other functions, and erase all,which wipes out all your saved text messages, offer additional peace of mind.You can also restrict access to phone book entries, although you can't erase thephone book memory in one fell swoop. The T18LX also supports digital voiceencryption, to ensure that only you and the person you're talking to can hearthe conversation. This feature is carrier-dependent as well, so check with yourservice provider to make sure it is supported. The T18LX doesn't feature aminibrowser, which may cause some to lose interest. However, you can use thephone as a wireless modem with your PC or PDA to swap phone book information, aswell as send or receive data faxes, upload or download files, and make Internetcalls on the mobile network. Your carrier and plan must support these features,but if they do, all you need to do is spend some time with the user's manual andyou'll be ready to use your phone as an extension of your office. The T18LX'sNiMH battery is rated to last for a maximum of four hours digital talk time and80 hours digital standby time. In our testing, the phone held a call for 3.5hours, and ran for an impressive 95.75 hours in standby. The audible low-batteryalarm was loud enough for us to hear when the phone was about to die, and theincluded rapid charger brought the T18LX back to full power in just over onehour. With infrared-powered PC synchronization features, polyphonic ringtones, a speakerphone and support for AT&T Wireless Internet services, the GU87 is a powerful mobile companion. The phone features a sleek clamshell design with a 132 x 176 color display with 65,000 colors. The outside cover of the handset sports a supplementary monochrome display that can display time, battery and signal strength, and more. The CIF-resolution (352x288) camera lens and self-portrait mirror is housed above this display. Most of the phone's features and on-screen menus are controlled by a five-way center button on the handset's control pad. An infrared data transmission port is supplied for synchronization with a PC or other device. Lastly, a 2.5 mm standard headset jack is provided for handsfree headsets. The GU87's built-in address book stores up to 200 contacts, with additional contacts storage available on the phone's SIM card. Picture ID allows you to assign pictures to your most common callers. Similarly, a ringer ID lets you assign ringtones to callers. A number of polyphonic ringtones come preloaded and more ringtones can be downloaded from AT&T Wireless' mMode service. In addition to a discreet vibrate ringer mode, a built-in speakerphone makes handsfree conversations a breeze. Voice dialing makes calling your friends, family and associates as easy as saying their names. The GU87's built-in web browser lets you tap into mMode downloads and mobile web browsing. AT&T's mMode service lets you receive and send emails, read news headlines, get sports scores, download games and ringtones, and more. Traditional text messaging, as well as picture and sound messaging are also supported by the phone. T9 text entry, which is a technology that makes it easier for people to enter words and text on handsets, is built into the unit-- a plus for mobile email and text messaging users. A number of handy software tools are bundled with the GU87 including a voice memo recorder, a calculator, a calendar and an alarm clock. The GU87 supports the SyncML PC synchronization standard via infrared, meaning it can connect to an infrared-capable PC to manage and synchronize contacts, calendar and other data. With the GU87's built-in camera, you can take and send pictures via MMS or transfer them to your computer via infrared. The camera features a 2x digital zoom for close-up shots. For mobile gamers, the phone supports games written on the Java platform. One game, Herding Sheep, ships with the phone and more are available via the mMode service. The Panasonic GU87 weighs 3.63 ounces and measures 3.84 x 1.93 x 0.91 inches. Its lithium-ion battery is rated at up to 5 hours of digital talk time, and up to 150 hours of digital standby time. It runs on the GSM/GPRS 900/1800/1900 frequencies. The phone comes with a one year limited warranty. I've had this thing for 3 days so far, & spent most of today at the SPRINT PCS service center trying to get this monster working properly! I wish I would've read some of these reviews first! After going through 3 Handspring Treo 600's in 9 months,(No joke! 2 broken ear speakers & 1 bad OS) I thought that this would be a Godsend. After spending the better part of today at the service center, I was told that they would have to send me another phone! I immediately asked if it would be a reconditioned phone, & was told "YES"...but it will still have a SIX month warrantee. My 3 day old phone came with a ONE YEAR WARRANTEE! I said absolutely not! As good as this PDA phone could be, it is not worth having to deal with the idiots at Sprint! After two weeks of trying to get Sprint to provide a working G1000, they have completely failed. And this is on the top-of-the-line phone they sell! The first issue was that the phone is not carried in the walk-in stores, nor are any accessories. But the clerks are happy to make a bunch of false claims about what the phone would do before telling you that. Next was getting the first phone which would reset itself every 1-15 minutes. Despite this obvious fault that prevented Sprint from provisioning the thing, it took multiple calls to replace it. Then the replacement, remember their most expensive phone, also showed up with a fault that prevents connection to the Internet! Fed up after hours on multiple calls to Tech Support with empty promises to "reprovision the phone over-night" I called Customer Service for a final time. Despite clearly stating I wanted a Senior Supervisor to handle return and cancellation of all my accounts, the run-around continued. After clearly stating what was needed and that under no circumstances to transfer me to Tech Services again, they transferred me right back to the idiots who had just said they couldn't figure out the problem! I'm left looking for the number for the local Federal Attorney's office to file a criminal fraud complaint. Then working through my credit card company to retract payment. Completely incompetent can only begin to describe Sprint! Don't buy this, or Sprint! Overall, I am pleased with the Samsung v206, probably only because I am not any sort of power user or a gamer.It is attractive to look at, the battery life is incredible, here in the Bay Area, I don't seem to have any problems with reception or dropped calls.However, the phone sometimes turns itself off for no reason.I called ATT customer service and they said this phone is sort of known for this problem, and they can't explain it.They offered a refurbished phone, but I didn't take them up on the offer.It happens roughly once a week, and I believe it's caused mostly by how I flip the phone open.I'm not rough with it, by any means, so I consider this (if it is the real reason) to be unacceptable. I can't understand why this phone doesn't have speakerphone.It costs enough. Sending pictures is completely impossible. You can't customize ringers and set them for individual caller id's. The thing that annoys me most is that there are no basic, simple ring tones loaded with this phone, and none that can be downloaded anywhere. I wasted time with Customer Service trying to get them to send me one simple ring tone - Samsung said that this is how AT&T orderd the phones and AT&T said that there is nothing they can do. Do you believe that there is nothing they can do? Incoming international phone calls with many digits aren't logged/stored in full, so you can't call people back because you're missing their last digits. My first Samsung V206 crashed; AT&T Wireless shipped me a new one and it works fine. However, all the numbers I'd stored on my SIM card in the old phone were transferred to the new phone labelled as people's cell numbers, whereas I'd stored some of them as work and home numbers. I can't seem to be able to re-label them. Nothing earth-moving, but also annoying. Cutting and pasting email addresses to move them between the camera options and the phone book options should be much easier. And as with all camera phones, the image quality isn't great. Grainy at best in low-light situations. Dat's all, folks. The phone is just alright; definitely overpriced. Get a cheap regular cell phone plus an ultracompact digital camera instead. To help solve problems for some folks! I have the Samsung V-205 for abnout 2 months. It is the exact same phone, but just for T-Mobile. Many complain that the only way they can get the backlight on the front to show the time is by opening up the flip so that the front light appears. But they complain that if they are like in a movie theater that it is too bright. The way you can view the front LCD light without opening the phone it is by pushing down on the button on the side of the phone for about 3-4 seconds. This causes the light to turn on. PROS: Better than the similar Sprint model (A600) because of the external display without flipping. Farely good ajustable camera and sufficiant storage for pictures. Option to block caller ID. One button silent mode. Ablity to change/remove service light. Calling groups with specific pictures and ringtones. CONS: The vibrate & ring alert option vibrates for a few seconds then rings. The external display screen only lights up only for an alarm, new message, or incoming call. Alarms do not have a snooze option. Hi, all I just bought my Samsung V206 phone and I just have to say it is the best one in my country so far (Barbados). My complaint is why did they not enable software for the camera to zoom in and out and oh yeah i love the pixels on the camera. This phone is not the best one that I have ever used, but a good solice model from AT&T.I have noticed in several other reviews that people have commented on the poor service.I have had very good service with this phone - perhaps it is the area they live in? Voice clarity is good and this phone almost never drops calls.My one problem is that sometimes the volume is low and it cannot be turned up any higher. The features are also great on this phone.The text messaging is smooth, and the phonebook is very nice in that it stores multiple numbers for one person wtihout having multiple entries in your phone book (eg you can put in home, work, and mobile numbers for one friend with their name only appearing once in phone book).The gprs service is also good - I have never had a problem with slow transmissions or anything else. I would recommend this phone as a solid organizer as well - the calendar function is good, as is the alarm clock.The only thing slightly annoying about this phone is that it is missing an external lcd screen and a camera - but if you want those, buy the NEC 525 (which has these).This is a good flip phone for the cost. This is one of the worst phone ever i have owned. Hangs up in the middle of the conversation and call does not end till it is shutdown. Least to say AT&T service is the worst ever i have encountered till now as a consumer. The service really sux. Half the time u can not receive the signals. The reception in the phone is very poor. Hangs in between you have to turn the phone off and switch it on again to make another call if it hangs in between a call. Till now i cannot figure out its due to the poor service provided by AT&T fellas or the worst quality of the phone. The customer service in AT and T is the worst i have ever seen in my life. I will rate the customer service as one of the poorest service in the world. MY ADVICE IS NEVER HAVE A SERVICE WITH AT & T IN LIFE AND NVER BUY THIS PHONE!!! This is my personal experience. Still if you want to try. Then i cannot help fate playing in ur life!!! Fully Features Phone, Looks Great & Great Price!!! MY OPINION ======I must say that I am a Nokia fan and was weary of trying anything else.It takes a lot to please me, but when I got this phone I was happy right away. For those that says it's bulky, well it's all your perspective I guess, yes it's a little longer than other flip phones on the market now, especially those tiny Samsungs.But I kinda like it because my sister has the tiny Samsung E105 which cost almost $300 and she drops it all the time, its hard to handle.I don't have this problem.The feel is great, whomever said it was cheap must probably want a $500 phone for this price.It's not cheap looking or feeling at all. PROS ======The most striking thing about this phone is the color scree, it's like looking into a tv. The menu, not at all confusing, and I came from using Nokia simple navigation for my past 3 phones.I never even went to the manual, figured it out after playing with it for an hour. The ring tones sound great ... I had a nokia 3200 with polytronic ring tones and this is even better. The graphics are wonderful.Very vivid and nice to look at.Overall the screen in the biggest plus, and it's a very big screen too which is what makes the phone a little bigger. COMPARISONS ======It's funny I was reading one users opinion on amazon about this phone, they said they sold this and got the Nokia 3200, well I did the opposite.The nokia 3200 is a great phone, very nice features (you can read my review on it on amazon) but its so ugly, and talk about bulky.It's also wrapped in plastic.No!! !Lastly, the resolution on this screen versus the motorola, No Comparison!!! Compared to the Motorola T720 & T721, they are a little shorter in height but wider, so I wouldn't say either is great in size.The outside display is nice I have to admit.The buttons on the Motorola are nices, they have silver around them, all that fancy stuff which wears off in about 3 months (I used to have the Matrix Nokia 8890 phone which was all chrome and silver, I had to replace the parts 3 times in one year cause it was frequently scratched or worn).So if you're going to be texting and using the phone alot, the buttons on this phone will take your longer.Lastly, the resolution on this screen versus the motorola, No Comparison!!! Compared to the Samsung E105, I found the samsung to be more plastic feeling, of course if SIZE if your only concideration in finding a phone and outside display, well samsung wins then.But in terms of menu, functionality, and resolution, and tones ... this phone wins. ... Well those are all the phones I worked closely with and can tell you about. CONS ======Again, it's not the smallest phone out there, but not by far the biggest or bulkiest.It's a good size. It's true, its a little hard to find NEC accessories, but not on Ebay. PRICE ======Sold my nokia 3200 for this, earned $70 for the transaction.Couldn't be happier.I think with a new plan you actually have to pay out of pocket, it's because of all the features that this phone has and the screen resolution. OVERALL ======Lets face it, phones like computers come in and out so quickly.I've never had a cell phone for over one year.I think this is a phone which I will enjoy for a year, then off to another model. For those giving this phone a bad rating because of poor reception ... check your carrier!! !It's not the phone.The dropped calls ... not the phone!I have AT&T in CA area, excellent reception.I had TMobile up until a few months ago, I found AT&T reception much better.I always have reception everywhere I go including inside malls, bathrooms, elevetors and at work. The Sony Ericsson T616 features a built-in digital camera, Bluetooth, multimedia messaging, polyphonic ringtones, and tons of ways for you to personalize its look and feel. Quality materials and a large color display give this phone its sophisticated personality. It's the perfect complement to AT&T service. The phone features a bright, clear 128 x 160 screen with 65,536 colors. The stylish candybar form factor of the phone will turn heads and get attention, while the quick camera buttons and easy-to-use center control toggle make it a snap to operate the T616. Charging and data connectivity are provided on the bottom of the phone, while an infrared transmitter for synchronizing contacts and data is housed on the top of the device. Meanwhile, the phone's CIF-resolution (352 x 288) camera is housed on the back panel. An onboard joystick and iconic menu make for easy navigation. When you're calling, you'll enjoy essential features like redial, vibrating alert, speed dialing, and side volume keys, as well as choice extras like sleep mode, menu shortcuts, keypad lock, SIM card lock, voice control, and status view. Create your own ringtones with the built-in MusicDJ using a library of pre-loaded instruments, rhythms, and melodies. Further, the phone's 32-voice polyphonic ringtones make your incoming calls sound like music to your ears. Use the ringtones that come with your phone or download new ones from AT&T's mMode mobile Internet service. And because the T616 has Bluetooth built in, you can use a wide array of Bluetooth-compatible headsets for total wireless freedom. The T616 has all the bases covered when it comes to messaging. Support is built in for sending and receiving text, graphics and sound via messages. Multimedia messaging (MMS) lets you compose your messages using images, sounds and text. Sony-Ericsson's QuickShare feature, meanwhile, lets you share content with other devices, other phones, even your computer--just drag and drop pictures from your PC to your phone. Instant messaging is also supported and the phone ships with a built-in email client (AT&T messaging charges apply). T9 text entry, which is a technology that makes it easier for people to enter words and text on handsets, is built into the unit-- a plus for mobile email and text messaging users. The T610 has a built-in camera with 2MB of onboard storage. Getting on the Internet is easy with the T616, as well. It supports the GPRS protocol for speedy downloads and wireless Web access. AT&T's mMode service lets you receive and send emails, read news headlines, get sports scores, download games and ringtones, and more. The T616's Bluetooth capability lets you connect, wirelessly, to a laptop, a PDA, or another Bluetooth phone, and users of Apple computers can synchronize their calendars and contact information with the T616 using iSync, Apple's free synchronization software. A number of handy tools come with the phone, including a memo pad, a calculator, business card exchange, a calendar, and a tasks list. There's also a full-featured clock, which includes a stopwatch, an alarm, and a handy timer. The camera T616's camera couldn't be easier to operate, with just one click to activate it and another to take a picture. Want to view your pictures on your computer screen? The T616 can automatically enlarge pictures to VGA size (480 x 640 pixels). Software included in the phone recalculates picture size without sacrificing quality. Mobile gaming has never looked better than on the T616's high quality screen. Force and sound feedback guarantees full-throttle fun. The T616 comes with a variety of embedded games, including the legendary racing game V-Rally 2, and many more are available for download. The Sony-Ericsson T616 weighs 3.26 ounces and measures 4.02 x 1.69 x 0.67 inches. Its lithium-ion battery is rated at up to 9 hours of digital talk time, and up to 300 hours of digital standby time. It runs on the GSM/GPRS 800/1800/1900 frequencies. The phone comes with a one year limited warranty. -UI lags behind button presses in every area. -Reception sporadic, especially in cars. -Camera is awful (even at highest resolution, images always look blurred and are sometimes unrecognizable). -Bluetooth frequently causes phone to freeze up (must be restarted). -Causes interference with anything with a speaker from up to five feet away.I don't know if it's checking if I have voicemail or what, but almost anything within five or six feet that has a speaker chirps a little machine song every minute or so.I've never had this problem with a phone before and it drives me NUTS. Either spend the extra money for the T637, or get a different phone entirely - just don't waste your time and patience on THIS. the muwap.com site they mentioned here a while ago? Sony's products are known for being very stylish, and this phone is no exception.Everything about it is organized, compact,and very very sleek.The menus are logical, however they take a little getting used to, but overall is very good.One thing that I like in particular is that you dont have to worry about random little things- for example if you're trying to store a number and get a call, it will handle the call, and once you hang up everything you were doing i the contact book will still be there and ready to go.Anyway, overall it is a great phone.The only problem I've experienced i the 5 months I've had it is that the joystick became slightly stuck in the past.It's not much of an issue, but somewhat annoying (although I've read that you can purchase a cheap replacement part if it's really an issue. )Overall, an excellent little piece of technology. The feature packed t616 cell phone from sony ericsson packs so many features into such a small place that you wonder how the makers did it. With bluetooth, camera, gprs, and other key features, the t616 makes your phone fully capable of doing everything you would want it to do besides making toast. My t616 works very well however sometimes I find it hard to view the screen when I am outside because the sunlight makes it difficult. THe bluetooth is sometimes hard to use but the phone overall works fantastic. Just one thing to clarify.Unlike what the previous reviewer said.There is 1 button voice mail retrieval with AT&T wireless.If took me quite a while to figure out... and for the life of me i don't think i could find it again.Just ask a cs rep.
-Nice Design, compact easy to carry. -Slow button response and sometimes no response. -The end call button and back button are different buttons.So when ending a call and then starting a new one or using a different function, you have to press 2 different buttons to get to the main menu.With the slight delay in button response and sometimes the buttons don't click when you think they do, it means you have to be looking at the screen otherwise you'll end up in a completely wrong menu.No easy navigation simply by getting used to the feel or buttons. -This leads into the next and most frustrating problem.Glare.The phone is impossible to see in any sort of overcast or bright situation.And in Seattle, overcast is every day of the year.I've put away my phone in disgust many times because i simply can not read who's calling or can't see who to call or what menu i'm on.Even if you're covering the phone with one hand it's very hard to read. -This would be less stressful if it had a true speed dial.But the only 1 button speed dial is to voicemail.All other speed dials are 2 buttons.And speed is definately not the key word.Apon starting a speed dial... it takes almost 5 seconds to even start dialing. -A typical calling situation would be something like this.Grab the phone press 2 buttons to unlock, 2 buttons to speed dial, wait 5 seconds for it to start dialing... wait a little more... look at my phone, cover my phone with other hand and look harder at my phone... realize I still haven't even dialed because one of the buttons didn't respond or it stored a random number before it locked, then get locked out again and start over. -Photo quality is weak.Photos will look good on screen then look awful when sent. -Not enough memory and slow storage.If you use the camera, you will constantly be deleting text messages, photos and sounds to make room.And when you do take a picture... it will take 10-15 seconds to take the next picture. -Poor to average reception quality.It's nice to carry an internal antenna phone, but not to talk on one.Will commonly have 1 bar less than some other phones on same service.